12 " x 8.5 " using 3.5mm and WW yarn. Can be made larger or smaller by adjusting hook and yarn. 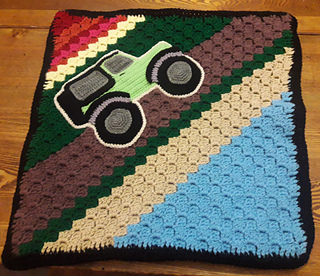 This pattern is for a LARGE Jeep Applique, perfect for adding to blankets, pillows or bags. The Jeep lover in your life will LOVE this applique, which will give character to any of your larger handmade gifts. It can also be glued to a base (such as wood or cardboard) to make a cute wall hanging for a child. The possibilities are endless, which makes this applique pattern so great! The pattern for the blanket in the picture is not included. It is a simple Corner-2-Corner blanket, approx 24” x 24”, made to resemble a scene of a dirt road by the ocean and forest. 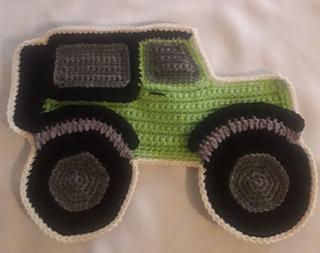 You could also make a blanket with roads, a solid color pillow with the Jeep embellishment….add it to a bag to use for a day out on the trails….or add other car and truck appliques that are available out there and suit it to either girls or boys, women and men. This is an advanced beginner/intermediate pattern, as it requires a bit of hand-sewing. It is written using US standard terms. There are plenty of pictures for the assembly stage and step by step instructions. Using a 3.5mm hook and Medium worsted weight yarn, the applique will measure approximately 12” long x 8.5” wide. You can make it smaller or larger by adjusting your hook and yarn sizes. If you have any questions, or require assistance with your project, please feel free to contact me!